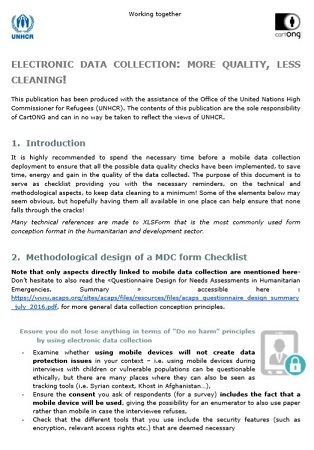 Home » Information Management » Mobile data collection: more quality, less cleaning! CartONG has compiled a detailed list of recommendations to foster quality in electronic data collection. It is indeed highly recommended to spend the necessary time before a mobile data collection deployment to ensure that all the possible data quality checks have been implemented, to save time, energy and gain in the quality of the data collected. The purpose of this blog post is to serve as checklist providing you with the necessary reminders, on the technical and methodological aspects, to keep data cleaning to a minimum! Some of the elements below may seem obvious, but hopefully having them all available in one place can help ensure that none falls through the cracks! This publication has been developed in support to the Information Management activities of the FICSS/DPSM (Field Information and Coordination Support Section/Division of Programme Support & Management) of the United Nations High Commissioner for Refugees (UNHCR). Below is an overview of the main elements of the checklist. We also encourage you to have a look at the blog post written by Noel O’Boyle from Medair on the ODK checker dashboard, a Qlik Sense dashboard designed to quickly check an ODK form design (xls or xlsx format) against a list of quality standards and common manual errors. Note that only aspects directly linked to mobile data collection are mentioned here. Don’t hesitate to also read the «Questionnaire Design for Needs Assessments in Humanitarian Emergencies, Summary » accessible here : https://www.acaps.org/sites/acaps/files/resources/files/acaps_questionnaire_design_summary_july_2016.pdf, for more general data collection conception principles. Check that the different tools that you use include the security features (such as encryption, relevant access rights etc) that are deemed necessary. Choose a relevant app, device, interface to do the job! Check the mobile device has the features you might need, such as functional GPS working offline, decent camera, good screen space, ruggedised, etc. Be wary of the magical harmonised or imposed app suggested that might not be adapted to your specific context. Check the interface you will use for collection (mobile and/or webform) is well thought out. Make sure you adapt the design to the interface in question to make it as user friendly as possible and also because there may be features with different functioning modes between these different interfaces. Make sure that your exported data is as “ready-to-use” in your given data analysis context as possible. 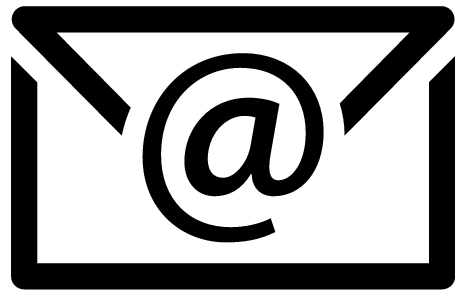 Apply exhaustive data validation logic: there should never be open numeric fields (maximum and minimum constraints can nearly always be derived from secondary data and/or piloting/experience), you can also use Regex constraints, limit the number of entered characters for text fields if it makes sense, ensure that multiple option answers selected are adapted (i.e. that you have selected a minimum or maximum number of options, that you have not selected “none” at the same time as another option etc), that a date selected is in the right range (past or future) etc. Verify that the mandatory single-choice/multiple option questions all have the necessary safeguards (“Don’t know”, “Unknown”, “Other”, “N/A”, “None of the above”, “Refuse to answer” etc) to avoid forcing your enumerator to enter incorrect information to be able to submit his data. Translate the form into all necessary languages to avoid mistranslations by enumerators. See if some variables could not be set up as cascading lists to avoid any error entries and ensure than any list of options is as short and relevant as it can be- any extra click is a possible error! Conform to basic data management principles- you won’t regret it in the long run! Prepare a Standard Operational Procedures concerning your “data quality” schedule/plan during the data collection (if you wait until the end of your data collection, it may just be too late ! Testing testing testing and more testing! Make sure you have the tools tested by your thematic project managers, technical colleagues familiar with mobile data collection, enumerators, and any other relevant stakeholder – they may have some good ideas for improvement that you may not have thought of. The most important aspect to test will actually be that test/pilot data actually corresponds to what you expect it to correspond to and is usable in your analysis tools / compatible with your analysis plan. The pilot should be a close to real conditions as possible: same mobile devices, same context, same type of interviewees, etc. If you use groups or repeats in your form, ensure you have a pair for each one. mandatory settings for integer, decimal, select_one, select multiple, date, text types of variables. Deploy from a clean slate: Empty all previous test or real data / forms from the phone to avoid “noise” or an enumerator selecting the wrong form or wrong form version, delete any unnecessary apps and multimedia to gain space. Print relevant paper version of the electronic forms and all other supporting material needed for field enumerators to get the electronic data collection job done in the best conditions possible (HH composition forms etc).